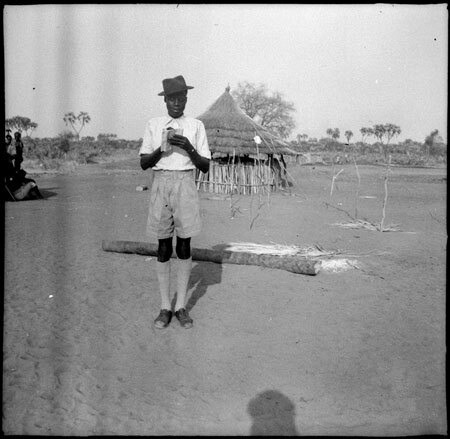 A full-length portrait of a Mandari youth standing in a homestead wearing European light shirt, shorts and hat, making a note on a piece of paper. A group in the background sitting in the shade of a hut to the left of frame look on, giving the portrait a sense of performance for the camera. Morton, Chris. "Mandari youth writing" Southern Sudan Project (in development). 03 Jan. 2006. Pitt Rivers Museum. <http://southernsudan.prm.ox.ac.uk/details/1998.97.200/>.